I often wonder how gangs of ne’er-do-wells get along before they reach the critical mass that attracts a hero to sort them out, and what it is that they do all day. Pistolwali doesn’t answer the first of those questions, but it does provide plenty to look at as you ponder whether what they do all day is make their own outfits and fight over the dress-up box. K.S.R Doss’ Pilla? Piduga? 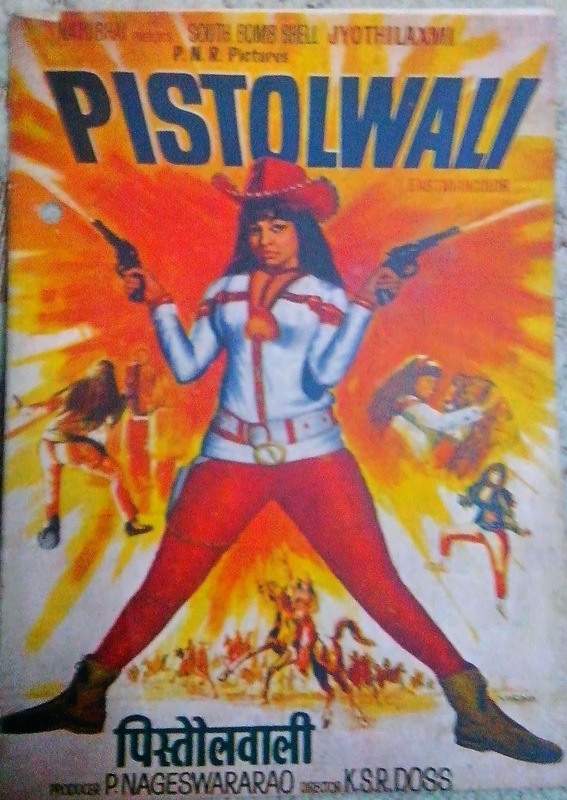 was either dubbed or partially reshot in Hindi as Pistolwali. Both (unsubtitled) films are on YouTube so choose your poison. I have chosen to use the Hindi version as some actors and both Helen and Jayshree T appeared to be speaking Hindi and this film is all about the authenticity…Plus I understood more of the dialogue even if I couldn’t read the significant clue written in blood. 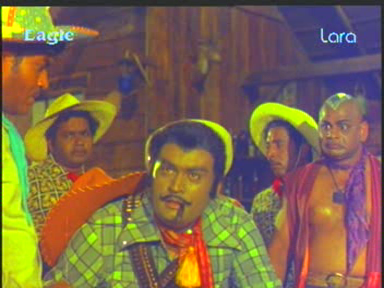 Like so many other Telugu cowboy themed revenge films, this one is set in a time and place that exists only in Telugu cowboy themed revenge films.The movie opens with Raaka (Satyanarayana Kaikala) and his gang attempting a train heist. 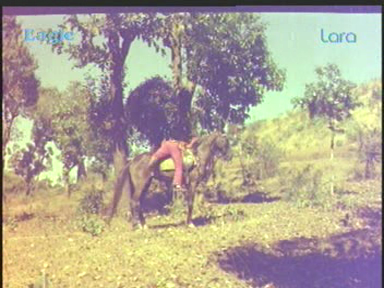 A brightly clad cowboy (Ramakrishna as Amar) puts them out of business from his perch in a convenient tree. It’s cowboys vs cowboys and hat colour is not a reliable indicator of anything. Maybe if we saw the floral sunhats being stolen from helpless old aunties it might be suitably Bad, but instead it just looked like a job lot guaranteed to brighten up every occasion. And there was that one guy who just painted his scalp silver. 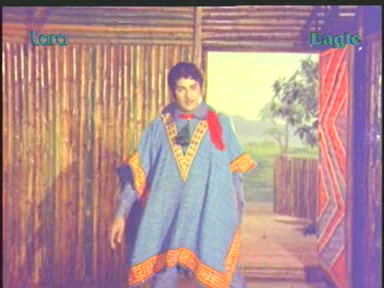 Reeka (Prabhakar Reddy) seems to have fewer marbles and fewer outfits than Raaka. He throws childish tantrums that quickly escalate into homicidal rampages. And that is the nicest thing I could say about him. “South Bombshell” (according to the poster) Jyothilaxmi is Neelu. She is first seen cavorting in a daring swimsuit but later changes into equally fashion forward pantsuits. 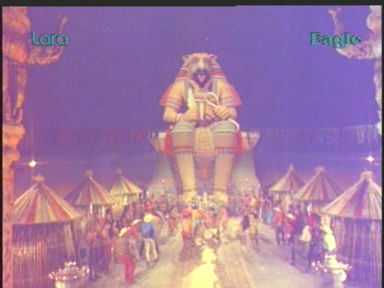 The villains go too far when they steal from the temple, and Neelu sets off in pursuit. She swaggers, shoots and curses like a hero rather than a heroine relying on womanly wiles, and generally she rescues herself. Jyotilaxmi wears some abbreviated costumes and gets a big dance number, but Neelu isn’t a girly girl. Neelu gets roughed up by her adversaries but how to say this… they don’t get rapey and creepy with her despite the allure of her midriff. She is a foe and they deal with her as a threat, not as a plaything. She is tough cookie and I suspect it would take a bit to outrage her modesty in any case. When Helen gives it her all in Hoga Sa Hoga, Neelu fills the time honoured role of hero looking like they’d rather be elsewhere. Although that may also be professional item girl rivalry. Neelu has her own ideas and just goes and does her thing. Even if that includes falling through a trapdoor and wrestling a (sight impaired) tiger. And she has a straightforward approach to relationships. I am not sure it was desire for authenticity or just directorial cruelty that had her struggling to get on and off horses, but it looked like Jyotilaxmi did a lot of her own action scenes. The viewer learns that Raaka is Neelu’s biological father long before she does. Raaka raped Lakshmi and left her for dead before also maiming his friend and rival for Lakshmi’s love. She fell pregnant as a result and she and the baby were taken in by her now one-legged true love who seemed to think it was the right thing to do. He may have been grooming Neelu for vengeance as well, but he seemed like an affectionate and over indulgent filmi Daddy. 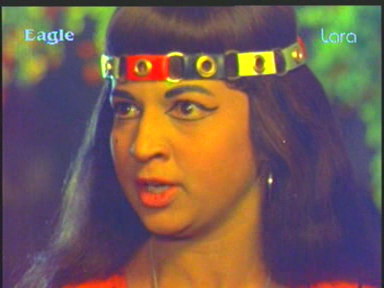 Neelu was none the wiser about her parentage until quite late in the film. That might all sound a bit progressive so let me assure you that the way it was revealed to her made me deduct a lot of the good parenting brownie points. Ramakrishna is technically the hero but Neelu overshadows Amar in all respects. He does an OK job and he doesn’t get in her way, but apart from some excellent outfits he achieves little of note. Although I did giggle at his inept dealings with the ladies. On the subject of costumes, it looks as though each main character was issued with one distinctive pair of boots and they pretty much wear them throughout. 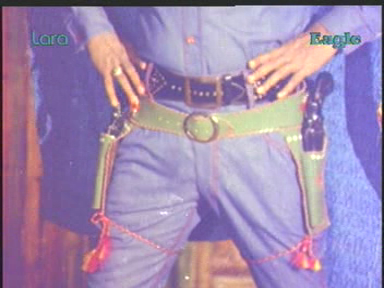 Raaka’s boots were particularly special and Satyanarayana Kaikala was suitably over the top to match. And the outfits did help a little with identifying characters in the many and varied fights and action scenes. K.S.Madhavan threw everything and the kitchen sink into the stunts. However I have to say that the plot is quite cohesive and to an extent, I would almost say logical. The background music is a brilliant mish-mash of fuzzy surf rock and funky Hammond organ with classic cowboy guitar strumming and the odd slide whistle. The song set pieces are unashamedly random and the film has an embarrassment of item girls that all get a guernsey in featured numbers. Jayshree T is always so perky, I love watching her dance. She always seems to wear more hair than clothes but I never see her as really skanky. 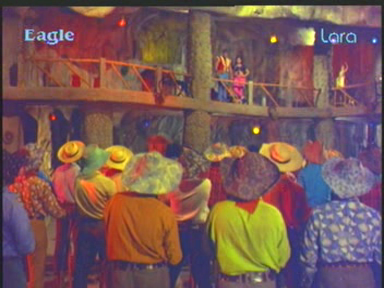 Helen and her creepy blue contact lenses appeared in a nightclub song and Jyotilaxmi got a dance in a fabulous Fauxgyptian inspired village set with what may be happy go lucky tribal cannibals. The camera is often at crotch level which is a bit confronting. But to be fair, the camera wasn’t just upskirting the ladies. Once seen, never unseen. 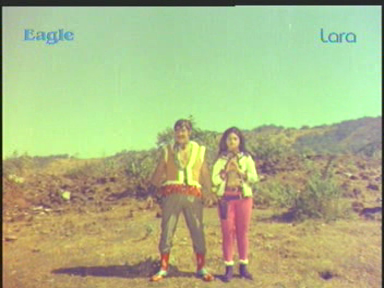 This is one of my favourite heroine-centric B movies from 1972 and Jyothilaxmi is perfect as the righteous gunslinger. See it if you have ever harboured thoughts of wearing a fur trimmed vest with fringed pants but weren’t sure how to accessorise, or if you want a primer on tiger wrestling for the modern lady. 3 stars! This entry was posted in Bollywood and tagged Adventures without subtitles, Helen, Hindi, Jayshree T., Jyotilaxmi, K.S Madhavan, K.S.R Doss, Kaikala Satyanarayana, Prabhakar Reddy, Ramakrishna. Bookmark the permalink.